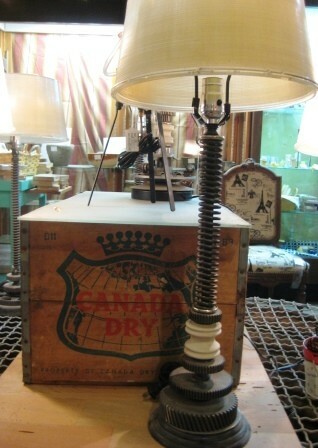 Home » Forklifter Profiles » Have you seen the Steampunk Lamps? 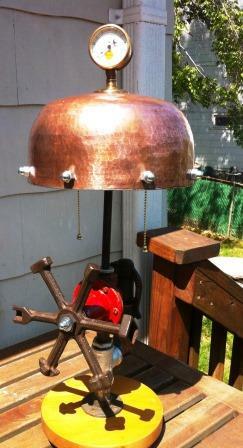 Have you seen the Steampunk Lamps? 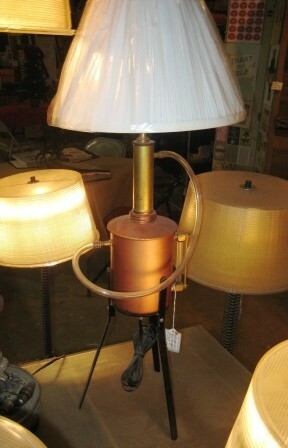 Generated from an artistic movement that blends Victorian form with Industrial function, steampunk lamps have become a welcome and appropriate addition to this year’s Green Gift Fair at Community Forklift. Made from copper pipe fittings, ironclad cog wheels, and a pure vision of steampunk art, both Terry Lewis and Ann Van Soest offer individualized pieces that celebrate history, culture, and environmental consciousness. They’re going quickly, so don’t wait till Christmas Eve to visit our warehouse! * The Forklift’s fifth annual Green Gift Fair, which runs through Dec. 29, features the handiwork of over thirty organizations and individuals. In addition to steampunk lamps, gift seekers will find an assortment of eco-friendly & affordable paintings, clothing, metalwork, woodcrafts, toys, baby gear, beauty care products, candles, greeting cards, housewares and stained glass mosaics. Some of the artists will be sharing their skills with Forklift fans during free weekend workshops.